Strengthening communities by bringing people and congregations together to foster initiatives for improving lives through social justice work - this is the mission and purpose of United Action Connecticut. United Action is an interfaith, multi-racial, multi-lingual organization crossing political, economic and urban/suburban boundaries. We hope that you will join us in our pursuits to advance civil rights for immigrants, improve health care access, build awareness for mental illness, and to lobby for key legislation in these areas. Isais Iriarte, an undocumented immigrant from Mexico, and the owner of the El Paso Restaurant in Plainville was deported back to Mexico on Wednesday, December 26, leaving behind his wife, two daughters and his business. 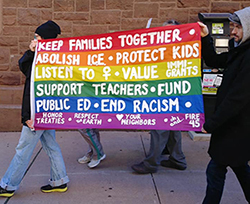 United Action CT (UACT) members were outraged at the timing, manner and swiftness at which Iriarte was picked up by Immigration and Customs Enforcement (ICE), detained and deported. How this happened and background on the Iriarte family. On Friday, Dec 7th, Iriarte and his wife were running errands for their restaurant when a black van with red and blue lights pulled them over. Two agents dressed in black with Immigration and Custom Enforcement (ICE) badges stepped out of the van, taking Isaias and leaving his wife alone. Having a strong belief in a better life in the United States, Iriarte opened his own restaurant, the El Paso Mexican Restaurant in Plainville, in 2002. It has been a well-known establishment in the community for over a decade. He has two daughters. Jalinne Iriarte, a CCSU student, was born in Mexico and her father believed that if they stayed she would have to drop out of school to work and that she would have to marry early. Having a strong belief in further education for his daughter and a better life, Isais paid her tuition and she is now pursuing a degree in marketing and management and had hoped to take over the restaurant. The other daughter, Bitzania, is a senior in high school and hopes to study physical therapy. Iriarte was immediately sent to a detention center in Massachusetts and then shortly afterwards to another in New Hampshire. Despite strong public support and pleas from his attorney, Anthony Collins, asking ICE for discretion to allow him a chance to stay in the United States and make an appeal to an immigration judge, Iriarte was put on a plane and returned to Mexico the day after Christmas. Action taken by UACT members. UACT organized a press conference and community gathering on Friday, December 21 at the El Paso Restaurant to bring awareness to Isais dire situation. The restaurant was full of supporters including State Representative William Petit Jr., who urged attendees to contact ICE and voice their support for the family. The expedited deportation for Iriarte, who has been in the U.S. since 1999, apparently hinged on the fact that he returned to Mexico in 2003 to see his dying mother and then returned illegally. Anyone who would like to help out the Iriate family can go to the following link and donate through GoFundMe. Between 100 and 150 people braved the cold temperatures and brisk wind in Hartford to participate in Al’s Walk for Immigrants on Sunday, October 21. 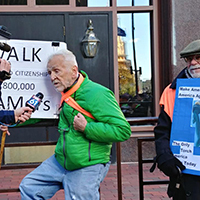 The walk was the brainchild of Al Dornan, a 79 year old man with severe scoliosis and spinal stenosis, who has been walking 2.2 miles for immigrants every day since January 25th, 2018. 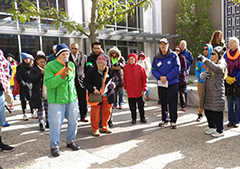 With the help of United Action CT (UACT) and several other individuals and groups, Al organized the special walk in downtown Hartford. The walk began at the Ribicoff Federal Building on Main Street and proceeded to five additional locations with immigration history before ending with a peaceful rally at the Federal Building. The other locations, Hartford City Hall, the Old State House, St. Patrick-St. Anthony Church, the State Capitol and Center Church all featured guest and immigrant speakers that provided words of unity, solidarity and advocacy for the undocumented immigrant community. Speakers included Hartford Mayor Luke Bronin, Senator Gary Winfield of New Haven, Rocky Hill Town Councilman Chris Duff and Nancy Burton, coordinator of the Chalice Sanctuary Team at the Unitarian-Universalist Church in Meriden. Several clergy also spoke including Pastor Abraham Hernandez, Rev. Jan Carlsson-Bull, Rev. Aaron Miller, and Rev. Kent Siladi. Father Jim Shanley began the proceedings with a prayer. Speaking on behalf of the immigrant community were UACT organizer Jose Diaz, Michelle Cardono, Andrea Sanchez, Camilla Bortoletto, Victor Constanza and Roshaney Tahir. The New England Mariachi Band also participated in the walk and the throng of participants marched, chanted and carried numerous signs, placards and banners advocating for immigration reform. Although the day was cold and windy the majority of marchers stayed for the two and half hour walk that ended with Al Dornan pledging to continue to walk every day until he can physically no longer do it. In an attempt to show national solidarity, Al also organized over 20 “mirror walks” in other cities across the United States on October 21. Al’s goal was to deliver a powerful but positive message to both our politicians and local communities. He feels it is time that leaders in both political parties rise above the fray and negotiate complete immigration reform that includes legal status and a pathway to citizenship for 11 million undocumented immigrants. For a full year, undocumented immigrant Sujitno Sajuti has lived within the walls of the Unitarian-Universalist Church while lawyers search for options. In recognition, the United Action CT member church hosted a one-year observance for the Indonesian native and Fulbright scholar, who was ordered by Immigration and Customs Enforcement (ICE) to board a plane back to Indonesia on the morning of October 10, 2017, after his request for a stay was denied. Instead, the 68 year old Sajuti sought refuge at the church with his wife, Dahlia. The observance on Tuesday night, October 9, included group prayer and a lecture on the legal obstacles undocumented immigrants face. Sajuti said his time in the church feels more like a “staycation” than house arrest. He arrived in the U.S. in 1981 on a student visa. He elected to stay after the visa expired and was detained by ICE in 2011, remaining in custody for two months. He had been on a stay of removal since 2013. Fortunately for Sajuti, who was been living in West Hartford, the Unitarian Universalist Church was finalizing its declaration as a sanctuary just as Sajuti’s time was running out. Burton and the sanctuary team designated a private area for Sajuti on the second floor of the church, making it impossible for ICE to enter without a federal warrant. In his room, Sajuti prays multiple times a day and reads to pass the time. Despite the restrictions, Sajuti remains positive. He rarely gets a sentence out without a chuckle in between. Sajuti watches the news in small doses, enough to keep him informed, but not enough to subdue his positive attitude. A federal court on Friday, August 3rd, ordered the Trump administration to fully reinstate the Deferred Action for Childhood Arrivals program — but an upcoming hearing means the program’s future is still in doubt. Hundreds of protesters from across the State of Connecticut, including members of United Action CT, rallied outside the Federal Building in Hartford on Friday June 6. The rally was in response to the separation of immigrant children from their parents in the latest directive of the Trump administration. The protesters were calling for the abolishment of ICE (Immigration and Customs Enforcement) for their cruel and inhumane tactics. Several protesters were arrested for blocking the entrance to the ICE offices, and a lot of chanting and sign waving took place but the protesters did maintain order. On Wednesday, June 6, United Action CT held its 12th Annual Justice Celebration at St. Francis of Assisi's Parish Center in Middletown. As is the tradition at UACT's celebration dinners, home made, ethnic food was served and the theme for 2018 was "It Takes A Community". Father Russell Kennedy of St. Francis, assisted by congregant Ivan Godoy provided musical entertainment and Health Care task force chairperson Ocean Pellett provided an activity for all the attendees to "build a community" during dinner. The highlight of the evening was the presentation of the 2018 Social Justice Honoree award that was given to Rev. Jan Carlsson-Bull and the Chalice Sanctuary team of the Unitarian-Universalist Church in Meriden. The U-U Church has been providing sanctuary to Sujitno Sajuti and his wife Dahlia since October of 2017. Sajuti came to the United States from Indonesia in 1981 as a Fulbright scholar and earned a master's degree at Columbia University. He then returned to Indonesia before re-entering the country in 1989 to pursue a Ph.D at UConn. His visa expired during his tenure at UConn and, rather than returning to Indonesia, Sajuti stayed in West Hartford. Now 68 years old, Sujitno was ordered to return to his native Indonesia but instead sought sanctuary in the U-U Church in Meriden. Sujitno and Dahlia entered the U-U Church on October 10 of 2017, not knowing when they'd be able to leave. Rev. Carlsson-Bull and the congregation of the Meriden U-U Church have opened their hearts to Sujitno and Dahlia. This year's Keynote Speaker was Natalicia Tracy, Executive Director of the Brazilian Worker Center in Boston, MA and Bridgeport, CT. She gave a heartfelt talk on growing up with the challenges of being a woman in a "man's world" as well as the difficulties of being an immigrant, domestic worker in the United States. Ms Tracy's accomplishments since those early years have been truly inspiring. She also praised UACT for their social justice work. UACT has been collaborating with the Brazilian Worker Center and several other groups on a campaign to improve home care by improving domestic worker jobs. The Meriden City Council voted unanimously Tuesday night, February 20, to send a letter to the Department of Homeland Security asking that city resident Nelly Cumbicos be allowed to remain in the country while her immigration case proceeds in court. Carrying signs and wearing “Keep Nelly Home” T-shirts, over 60 residents and officials gathered outside City Hall prior to the meeting and rallied to support Cumbiscos including Rev. Jan Carlsson-Bull of the Meriden Unitarian-Universalist Church, UACT executive Director Mark Kosnoff and several other members of the U-U church. U.S. 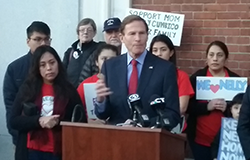 Senator Richard Blumenthal, D-Connecticut, attended the rally and condemned the immigration system. “I can pledge to you that we are going to fight for her, advocate, work for her at every level…to prevent this despicable betrayal of American law and value,” Blumenthal said. Cumbicos, 41, fled Ecuador and crossed the border illegally 18 years ago. Unaware a final order of deportation had been issued against her in 2002, Cumbicos was apprehended by Immigration and Customs Enforcement (ICE) while attempting to apply for a Green card in 2015. She lives with her husband, an American citizen, and 15 year old son who is also a citizen and attends Wilcox Technical High School. After receiving a stay in June of 2017, Cumbicos was given a deportation date of February 16. On February 9, she thought she had received a one-year stay, but ICE informed her four days later that the decision had been reversed and that she had to leave the country by Feb. 28. Cumbicos has a pending motion to reopen her order of removal with the Immigration Board of Appeals and an appeal with the Second Circuit Court of Appeals, according to Cumbicos’ attorney, Erin O’Neil-Baker. 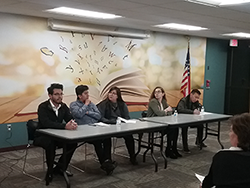 On January 30, 2018, United Action CT partnered with ACLU Power People for a forum titled “Undocumented 2018 - What are the Issues?” The event was held at the New Britain Public Library and attended by over 50 local residents. Marianne Hebenstreit of the ACLU Power People and Mark Kosnoff of UACT moderated the event, which focused on who the undocumented population in Connecticut are, and the psychological and legal issues that undocumented immigrants face. Ann Speyer gave an in depth presentation of who the undocumented among us are, including the education, occupations, ethnicity as well as other details. Karen Dworski, a licensed clinical social worker, spoke to how the constant fear of detention and possible deportation can psychologically impact immigrant youth. Immigration attorney Dana Bucin gave a riveting legal presentation, explaining the difficulties of people in some countries, notably Mexico, China and India, from coming to this country legally. She also urged those in attendance to get involved and press their Federal legislators to change the unfair and archaic immigration laws. The most compelling part of the evening came next when four Dreamers told their stories of emigrating and growing up in the United States. Jose Diaz, Mariano Cardoso, Sabrina Garcia and Sophie, all DACA recipients, recalled the difficulties and fears they have encountered over the years as well as the crushing disappointment of possibly losing their DACA protection. Also speaking was Jason Ramos, who is a U.S. citizen, but whose father is undocumented, and had to seek sanctuary in a New Haven church to avoid being deported. Finally, Mary O’Brien, the Global Solidarity Coordinator with the Office of Catholic Social Justice Ministry, called on all the attendees to put their supportive thoughts on paper. The OCSJM hopes to collect thousands of these “letters” to send to the current administration to demonstrate that local citizens support comprehensive immigration reform. United Action and the ACLU Power People plan to stage more of these informative events in the future. On January 24th, 2018, the Connecticut Immigrant Rights Alliance (CIRA), through the Community Foundation of Greater New Haven, awarded United Action CT (UACT) a Community Defense Mini-grant to be used to build a community defense network in Connecticut and provide information, outreach and services to Connecticut’s immigrant families and individuals. UACT will be focusing on the New Britain/Plainville/Bristol, Meriden/Middletown and Hartford areas to provide Know Your Rights and Emergency Preparedness forums as well as legal clinics. In addition UACT will develop Rapid Response plans in its areas of focus and provide personalized assistance. If you or your congregation or organization is interested in hosting a forum or clinic please contact UACT at 860-515-2284. United action CT (UACT) has joined a coalition of health care and advocacy groups that have formed the Protect Our Care Connecticut (POCCT) campaign that supports comprehensive, high quality, affordable and accessible health care for all Connecticut residents. UACT healthcare task force chairperson Ocean Pellett has been leading UACT’s participation in the campaign. defend Medicaid, Medicare and women’s health programs. advocate at the national and state level for policies that support health equity and health care for everyone. If you would like to receive alerts and updates on the POCCT campaign sign up at www.protectourcarect.org/sign-up. On September 23, 2017, United Action CT (UACT) hosted a Solidarity Gathering at St. Francis of Assisi Church in Middletown in support of the statewide home health care worker campaign. The campaign, also known as “Aging with Dignity”, is a project designed to improve home care services, and thus allow our elderly to remain in their homes rather than sent to nursing homes, by improving home care jobs. Home care services are primarily performed by domestic workers, who have historically been excluded from the protection of federal and state labor laws and many of these exclusions persist today. UACT is part of a coalition that includes the Brazilian Worker Center, the Naugatuck Valley Project, the Office of Catholic Social Justice Ministry, the New England Synod of the Evangelical Lutheran Church, SEIU Local 1199 and others that are advocating for a domestic worker bill of rights. Attending the gathering on September 23rd was Middletown Deputy Mayor Robert Santangelo, who indicated that he strongly supported the campaign. Over the ensuing weeks UACT pursued an effort to get the Middletown Common Council to pass a city resolution supporting domestic workers, the findings of the Domestic Worker’s Task Force, and the proposed development of a bill to protect domestic workers. With the help of Deputy Mayor Santangelo, UACT managed to get the resolution on the agenda of the December 4th Middletown Common Council meeting. During public comment, UACT executive Director Mark Kosnoff spoke in support of the resolution. Also in attendance, and in support of the measure, was Pastor Cathy Rohrs of the Middletown Faith Lutheran Church. After some discussion the Common Council passed the resolution by an 8-2 vote, and directed the City Clerk to forward copies of the resolution to the Connecticut General Assembly Task Force on Domestic Workers, the Middletown State delegation, the Mayor of Middletown and the Governor. The statewide coalition feels that city resolutions can be a useful tool in promoting increased rights and benefits for domestic workers by bringing attention to their plight.